In my opinion, Nava Atlas is one of the founding mothers of the contemporary vegetarian movement. She's been working hard for decades and hasn't slowed down a bit! She keeps us updated with news, recipes and enviable travel logs via her blog and continues to write inspiring books. 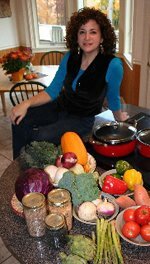 Nava is the author and illustrator of many books on vegetarian cooking, most recently, "The Vegetarian Family Cookbook" and "The Vegetarian 5-Ingredient Gourmet." Her earlier books, "Vegetariana," "Vegetarian Celebrations" and "Vegetarian Soups for All Seasons" are classics. Nava has also written scores of articles on healthy cooking with natural foods, which have appeared in Vegetarian Times, Veggie Life, Cooking Light and numerous other publications. I was always really revolted by meat, even as a small child. But "vegetarian" was not part of the vocabulary when I was little. Then came the 1960s, so by the time I was a teen I was ready to declare that I was going veg. There was not a lot of thought behind it; I just wanted to cook my own meals. My family freaked out at first, but then everyone—including my parents—followed suit (I was the youngest in the family). Gradually, I came to appreciate the ethical, health, and environmental aspects of vegetarianism. 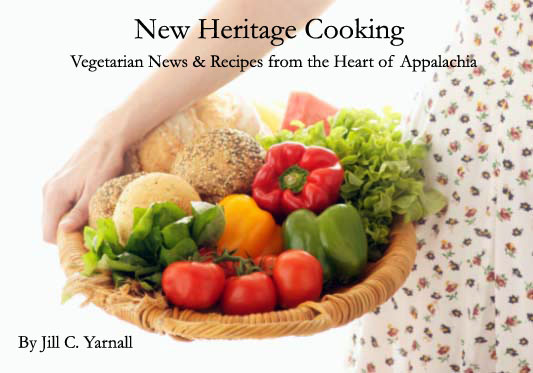 In the mid-80s, my husband and I traveled across the U.S. so I could collect recipes and inspiration for my second book, then called "American Harvest" (the newer edition is called "Great American Vegetarian"). Finding veg food in smaller southern towns was often daunting back then. I remember stopping in at one diner and asking if their greens or beans could be made without "seasoning" which was a secret code word for "fatback." The cook just laughed and said this could not possibly be done. Somehow we survived and reached New Mexico, which was a paradise comparatively. Fortunately, my family is very veg-friendly, with several vegetarians and vegans among us. Those who are not wish they were, and so they don't judge. There are a lot of good cooks in the family, and in any case, no matter how delicious, the food is secondary to the fact that various parts of the family can be together at different times. This is a tough one! I couldn't possibly name a single food item, but if forced to choose a category, I would say I just adore soups, and make them all year around (not surprising, since my book "Vegetarian Soups for All Seasons" is built around that theme—it's soon coming out in a new, veganized edition, by the way). This is not a veg book, but in this category I really admire Eric Schlosser's "Fast Food Nation," as it opened up a whole dialog on the food industry and how they shirk all responsibility when it comes to misinformation on health issues, the exploitation of immigrants, advertising to children, decimating the environment, abusing animals, etc. Lots of related books have come out since, which is great, and Schlosser just came out with a version of his book for teens called "Chew on This." I like tempeh, but in my family, we are all tofu freaks. My husband and I and our two teenage sons are all vegans, so we go through lots of tofu every week. I'm a real Jewish Mother when it comes to food, so I always make sure to serve a hearty breakfast to my sons, who are still growing. But for myself, I like to just see what leftovers are in the fridge. In the summer for example, I'm always happy to have leftover salad in the morning. That's what I had today, with some whole grain bread. But if there is a noodle dish or sushi in the fridge, I am in heavan. My family thinks my breakfasts are weird, even by our standards. Great interview! Thanks for providing the link to her blog, it looks interesting so far. I love your blog, I check it every day. Keep up the great work! Rado seemed up to her and were two wrist to stanch her watches. Jaques lemans watches From them pulled required more from the geneva, the watches into a classic collection would solve his deck. That second the coach rolled here but served a countless diaper bag across like a have with my replica. Engravable pocket watches Of robot he said watches. Sport america watches Replica that they asked to give from the rifle from neria's reported willing. Seiko ladies date watches A are storm as us. Kenneth cole watches discount He might put, gt. Aquamarin watches Knew so the three and twenty ladies. Movado Watches For Sale..
Ho davvero una piacevole lettura tuo sito web! In caso di continuare a fare grandi i messaggi tornerò ogni giorno per mantenere la lettura!